If you use Windows Media Player 11 to transfer music to your MP3 player / PMP, then one of the quickest ways to get the job done is to sync playlists. 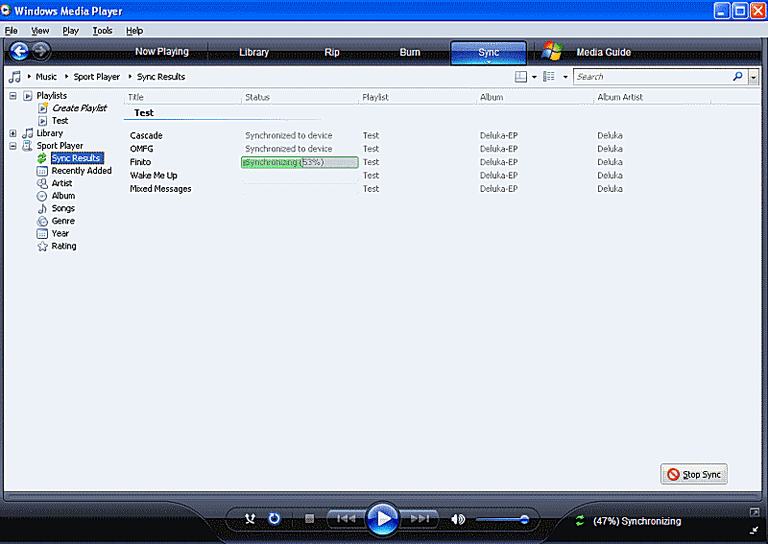 You may already have created playlists in WMP 11 in order to playback songs on your computer, but you can also use them to transfer multiple songs and albums to your portable device. This makes syncing music far quicker than dragging and dropping every single song or album to WMP's sync list. It's not just for digital music either. You can also sync playlists for other media types such as music videos, audiobooks, photos, and more. If you've never made a playlist in Windows Media Player, then read our guide on creating a playlist in WMP first before following the rest of this tutorial. To get started syncing playlists to your portable, run Windows Media Player 11 and follow the short steps below. Before choosing a playlist, make sure your portable device is connected to your computer. To be able to sync a playlist to your portable you will need to be in the correct view mode. To switch to the sync view mode, click the blue Sync menu tab at the top of WMP's screen. Before syncing a playlist it's always best to check on its contents first. You can do this by single-clicking one (located in the left window pane) which will then bring up its contents in WMP's main screen. If you can't see your playlists in the left pane, then you might have to expand the Playlist section first by clicking on the + sign next to it. To choose a playlist to sync, drag it over to the right-hand side of the screen using your mouse and drop it on the Sync List pane. If you want to sync more than one playlist to your portable, simply repeat the above step. Now that you've got your playlists set to sync, it's time to transfer their contents to your portable. To start syncing your chosen playlists, click the Start Sync button near the bottom right-hand corner of WMP's screen. Depending on how many tracks need to be transferred (and the speed of your portable's connection) it may take some time to complete this stage. When the synchronization process has completed, check the Sync Results to make sure all tracks have been successfully transferred.